The issue of treatment preference in type 2 diabetes is complex because there is a wide range of medication options. With these options comes consideration of drug-related benefits, harms, and burden as well as the likelihood or uncertainty of treatment-related outcomes. When measuring patient preferences, Dr. Purnell says it is important to determine how patients value specific outcomes, such as the importance of weight maintenance or glycemic control. It is also important to measure how patients choose between treatment options and how their choices are influenced by particular attributes of treatment. Although patient preferences are deemed important by major diabetes professional societies, little is known about how these preferences influence treatment for type 2 diabetes. To address this research gap, Dr. Purnell and colleagues conducted a systematic review that identified and analyzed studies of patient preferences in patients with type 2 diabetes not on insulin. The study, published in Diabetes Care, reviewed several databases for articles in which patient preferences for diabetes medication treatment were assessed. For the analysis, many important attributes were examined in clinical studies when assessing patient preferences for using non-insulin diabetes medications (Table 1). According to the study results, weight loss, weight control, and glycemic control were identified as key attributes of diabetes treatment that drove patient preferences when compared with treatment burden and side effects. 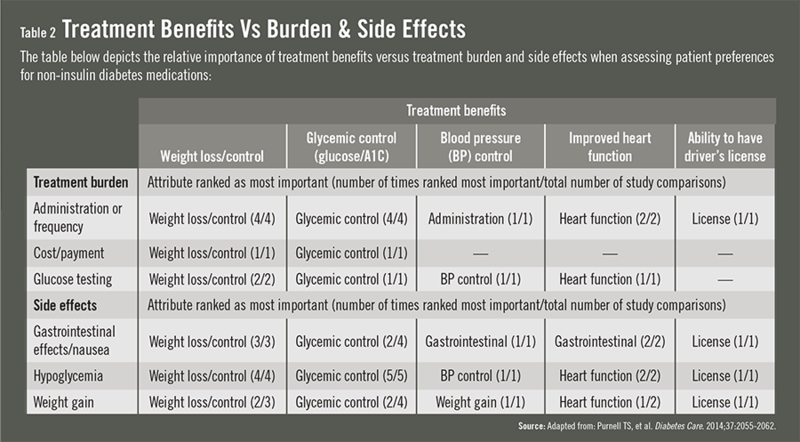 The most common attribute comparisons were weight loss/control and glycemic control versus treatment-related burden and side effects (Table 2). Increasing awareness about the importance of factors that influence patient preferences may have a significant impact on medication outcomes. For example, clinicians may believe that a certain drug is ineffective when the reality is that patients are poorly adhering to that medication because of its side effects. In some circumstances, side effects like weight gain can be avoided by switching medications. Dr. Purnell says clinicians should discuss the factors that patients value with treatment and recognize the factors that can negatively affect drug adherence. Beyond having clinicians consider the factors identified in the study, Dr. Purnell says greater efforts are needed to evaluate patient preferences in future research. With more research, there is hope that experts will develop evidence-based guidelines for improving how patient preferences are evaluated and incorporated into routine care. “Consideration of patient preferences in decisions about non-insulin medications is an important and necessary step toward individualizing care and encouraging patient-centered decisions,” says Dr. Purnell. The next step would be to develop and implement clinical decision support tools that incorporate patient preferences in the treatment of type 2 diabetes. The study by Dr. Purnell and colleagues also notes that efforts are needed to develop a widely accepted definition of patient preferences and how they should be measured. This information could then be incorporated into clinical guidelines. Dr. Purnell believes that her study team’s findings can serve as a starting point for such recommendations. These efforts may ultimately improve patient adherence to therapies for type 2 diabetes and optimize outcomes for those living with the disease. Purnell TS, Joy S, Little E, Bridges JF, Maruther N. Patient preferences for noninsulin diabetes medications: a systematic review. Diabetes Care. 2014;37:2055-2062. Available at: http://care.diabetesjournals.org/content/37/7/2055.full. Joy SM, Little E, Maruthur NM, Purnell TS, Bridges JF. Patient preferences for the treatment of type 2 diabetes: a scoping review. Pharmacoeconomics. 2013;31:877-892. Brown SE, Meltzer DO, Chin MH, Huang ES. Perceptions of quality-of-life effects of treatments for diabetes mellitus in vulnerable and nonvulnerable older patients. J Am Geriatr Soc. 2008;56:1183-1190. Hauber AB, Mohamed AF, Johnson FR, Falvey H. Treatment preferences and medication adherence of people with type 2 diabetes using oral glucose-lowering agents. Diabet Med. 2009;26:416-424. Tanjala S. Purnell, PhD, MPH, has indicated to Physician’s Weekly that she has received grants/research aid from the NIH and the Patient Centered Outcomes Research Institute.